Manoj Ramdas, formerly guitarist of Denish retro rock’n’roll band The Raveonettes, is back with a new collective called Spektr, carefully maintaining his love with past sounds, but otherwise departing considerably from his earlier musical direction. The five-piece has composed eleven short instrumentals (plus intro and outro that could be taken from an ELP album) that are a tribute to the masters of soundtrack music, with the shadows of Morricone, Mancini and many others lurking behind their backs. They use all kinds of instruments, from the typical rock accessories like guitar, bass, keyboards and drums to some more exotic paraphernalia, be they acoustic (banjo, mandolin) or electronic (tape manipulations, circuit bending). A big array of guest artists add retro synth sounds and orchestral arrangements. B/W vs. Technicolor is highly original in what it does, but by no means unique. Mike Patton’s Fantômas once covered the movie composers on their highly regarded The Director’s Cut, and Finnish transvestite performers Cleaning Women invented a soundtrack on self-made instruments for the silent movie Aelita – Queen Of Mars. Where does that leave Spektr? Well, their approach is in my opinion more original than the one practiced by Fantômas, but they don’t achieve yet a homogenous sound like the Finns. But then I guess that was not the intention. 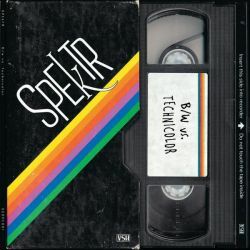 Instead it seems as if Spektr wanted to write virtual soundtrack songs for their album B/W vs. Technicolor. The multifarious instrumentation and above all the warm production that makes this CD sound like something from the Seventies are the main reason why B/W vs. Technicolor is a winner after all. Close your eyes, and you will certainly see images playing in your mind!